Oasis specializes in lawsuit financing for individual plaintiffs. Lawsuit financing is a means of obtaining funds specific to a legal personal injury complaint or lawsuit. Lawsuit financing provided by third-parties such as Oasis is permitted where available. Oasis Financial is the largest and most recognized national brand in consumer legal funding headquartered in suburban Chicago, Illinois, and with satellite offices across the US. Oasis provides non-recourse consumer legal funding to individuals involved in personal injury litigation, primarily due to auto and work-related accidents. As the industry leader, Oasis is a driving force in the regulatory and legislative areas of the consumer legal funding industry. Working with a variety of stakeholders, Oasis is defining the appropriate regulations and best practices that will guide the industry well into the future. As Oasis Financial and Key Health completed their merger and acquisition by a new private equity partner, several challenges became clear. Some of these challenges were, a lack of a single and well-defined development process and methodologies, the inability to hire and retain quality development resources, and the high cost of development required for growth. OSI Digital proposed building an offshore Application Managed Services team with dedicated resources for Oasis and Key Health development needs. The comprehensive solution included Engineering Services from requirements analysis to design, development and service management. The OSI Digital team provided QA Support from test planning and strategy, to design, preparation, execution and closure. And finally, Release Engineering services included source code management, automation script builds, continuous integration and code coverage analysis. 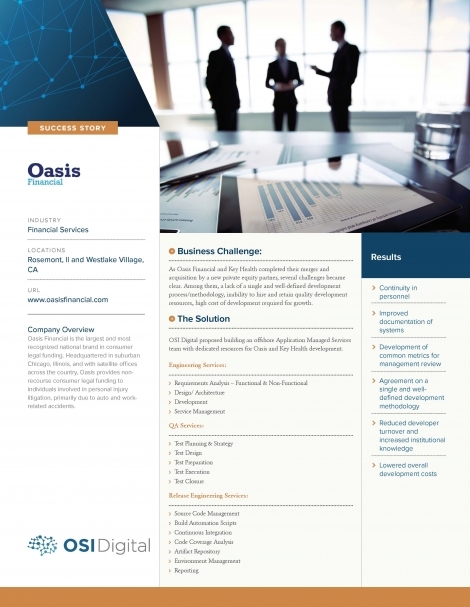 OSI partnered with Oasis to advance engineering, QA and release services for the firm.